Update: Deadline extended until Friday for Colorado, no excuses needed, and on the national exchange until Thursday for those who had trouble logging on today (Official notice here.). 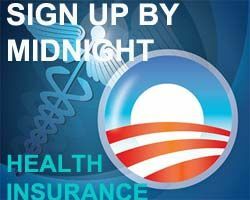 Midnight is the deadline to sign up for a health insurance plan under the Affordable Care Act for coverage beginning Jan. 1. Here's what's going to happen come Tuesday. This is my naked prediction, i.e., independent of any outside information. I've been sitting on this for two days, more out of laziness in putting it on the screen than anything else. And those of you who remember these things, will remember I am usually pretty darn good at my predictions being right. Under the House bill, health insurance would be regulated by a powerful new federal agency, headed by a presidential appointee known as the health choices commissioner. And we'd get a public health plan, that will be opposed by insurance companies, Republicans, business owners and doctors. Why doctors? The plan would initially use Medicare fee schedules, paying most doctors and hospitals at Medicare rates, plus about 5 percent. After three years, the health secretary could negotiate with doctors and hospitals....The bill would limit what doctors could charge patients in the public insurance plan, just as Medicare limits what doctors can charge beneficiaries. "This is not government insurance. We don't think that's the solution to these challenges. Individuals are going to have more responsibility," [House Majority Leader Rep. David Clark,] said. "Our goal is to try to find a way for every Utahn to have an opportunity to have access to health care." For the poor, the plan would aim to boost enrollment in existing programs such as Medicaid, the Children's Health Insurance Program and Utah's Premium Partnership for Health, which helps workers pay premiums. Working residents who do not qualify for those programs but can't afford health insurance would receive subsidies that put coverage within their reach. People who can afford health insurance but don't buy it could be prohibited from enrolling in university classes or getting a job. Nielsen said it's possible they could also someday face a tax penalty, as is the case in Massachusetts. The Salt Lake Tribune has more on the plan. Both Hillary Clinton and Barack Obama have introduced health care plans. Hillary says Obama's plan leaves 15 million people uncovered and only provides mandatory coverage for children. That appears to be the case. Here's Obama's plan (pdf.) There is a mandate that applies only to children. Nor has Obama been consistent in his statements on universal health care. Hillary maintains her plan not only covers everyone but also, like Obama's, cuts costs. Her plan is here (pdf). Both plans are improvements over our current system. I agree with Hillary that mandatory coverage should include everyone, not just children and 15 million uninsured is too many.